Ever wondered who wrote the first blog? Hint: there's no simple answer. 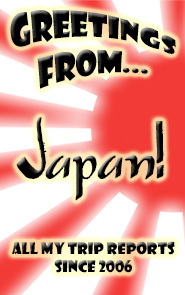 On roughly the tenth anniversary of the "blog", C-Net's News.com has an article up that talks about the form's origins (and possible definitions) and interviews some of those credited with being "first". It's a thoughtful, well-considered article that goes back to the .plan files that pre-date the internet itself, including a shout-out to the most famous .plan of them all, maintained by id Software's John Carmack. We've come a long way since those simple text files, although the basic format of the blog (a reverse-chronological listing of individual posts) has not changed much. A little late (in more ways than one) but I've had my new Westinghouse LVM42-W2 long enough now to write some decent hands-on thoughts about it. The LVM42-W2 is, as its name suggests, a 42" high definition LCD television. It could very well have been replaced by the time you read this - in April, Westinghouse will be releasing the TX-42F430S, one of a new line of television sets that feature some relatively minor upgrades in exchange for higher MSRP's. These upgrades - a dynamic contrast ratio (something of a marketing gimmick), the replacement of the DVI ports with HDMI, and a built-in tuner - were not worth the extra 2 months and $300 or so for me, but they certainly won't hurt. I'm sure most of this review will apply to the new sets as well. We were upgrading from a 26" Samsung CRT HDTV that we had always considered a "temporary" set, destined for eventual bedroom duty from the date of purchase. I had bought the Samsung after getting fed up with the horrendous compression Time Warner Cable NYC was foisting on its customers on the standard-def channels, knowing that eventually I'd be buying an LCD or plasma as my long-term television. I wanted a cheap HDTV, and the Samsung fit the bill at the time - $600 in 2004. 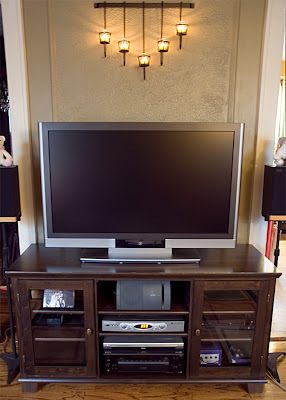 Cons: Low resolution, analog, bulky, heavy cabinets, geometry and convergence issues, doesn't scale well to large sizes, prone to glare and reflections, prone to "burn-in"
Cons: Low resolution at a relatively high cost, low maximum brightness, picture "noise" and lack of shadow detail in some sets, prone to glare and reflections, the "screen door effect", "buzzing" noise at high brightness, possibility of screen "burn-in"
Pros: High resolutions at a relatively low cost, thin and flat, direct-view digital, no geometry or convergence problems, high maximum brightness, immune to reflections and resistant to glare, immune to "burn-in"
As you can see, at the present time there simply is no perfect display technology. That said, we've all become spoiled - almost any HDTV set, regardless of technology, is capable of providing a picture that we could have only dreamed of 20 years ago. The "cons" listed above are really all relatively minor in the grand scheme of things. Which technology is best for you just comes down to your own personal preferences and how you plan to use your set. That's a component cable hooked up to my DVD player - the FiOS TV box is connected through HDMI on the other side of the "spine". The PC requirement, in particular, necessitated a direct-view digital set capable of 1:1 pixel mapping, where the TV's resolution exactly matches the PC's. This is easiest when the TV's native resolution is a PC-friendly resolution supported by the drivers included with modern graphics cards. It just so happens that 1920x1080 is one such resolution. This works out nicely, since the 1080i programming produced by most TV networks is also 1920x1080 (interlaced to 1920x540 in alternating frames). I considered plasma, which has a picture somewhat similar to CRT and is often the technology of choice for those moving directly from analog CRT to digital flat panel (as I was). The main problems there were the low resolution of most affordable plasma screens and the overall fragility of plasma technology. While burn-in is not the problem it used to be, plasma screens still have a tendency to color-shift over time, and even today, most manufacturers recommend using stretch mode or grey pillarboxing on standard-def content to help alleviate this. I didn't want to have to deal with babying my TV all the time. Now, there are plasmas with higher resolution - even up to 1920x1080 and supporting full 1080p content. While these may be something of a present-day holy grail in terms of picture quality, unfortunately, they're priced accordingly. A 1080p plasma set will set you back about $10,000. And you'll still need to worry about the screen door effect and buzzing and burn-in and other potential plasma pitfalls. I settled on the Westinghouse because it offers the best bang for the buck. While its price advantage is not what it once was (the big names have lowered prices in response), it's still priced about 20-30% lower than the LCD competition at the same specs, and in fact it has more inputs and better features than some of the big name brands. I could have spent even less and gone for lower resolution, either from Westinghouse or another manufacturer, but I wanted full HDTV resolution and true 1:1 pixel mapping. I also wanted 1080p to take advantage of Blu-Ray movies, which are definitely in my future. And I like the three digital inputs. A quick digression about names like "Westinghouse" and how they apply to the world of modern-day television. Westinghouse was once known for making things like washing machines. This is not the same company that exists today. Some people are afraid of buying TV's made by an "off-brand" like Westinghouse, Syntax or Vizio, but don't be. There are only a few panel makers in the world today and in fact, the panel makers working with these so-called off-brands have just as much experience in making flat panel displays as big names like Sony or Sharp - they've been doing it for big PC makers like Dell and HP for many years. These same manufacturers now make the panels for the smaller brands in the TV manufacturing industry. Back on-topic. There are those that will argue that you can't discern the difference between 1080i/p and lesser resolutions on a 42" screen, which is, to be charitable, BS. It's true, you can't sit back and count pixels (that's a good thing - no screen door effect), but on my set, at about 7 feet, there's a clear difference between 720p and 1080i content. 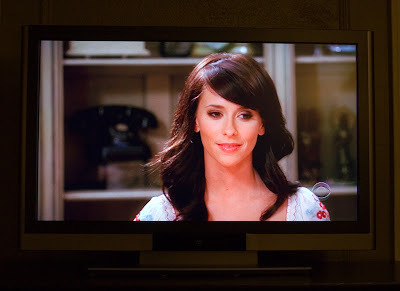 That's "Ghost Whisperer" in 1080i, on pause so it's actually displaying 1920x540. Still looks pretty good, eh? Fox and ABC are the only two stations broadcasting in 720p, and their content always looks soft compared to any other channel. It's subtle - I'm not going to say the difference is glaring - but the 720p channels are just not "tack sharp", and I find my eyes struggling to focus occasionally, as if the image is *almost* in focus but not quite. 1080i content, on the other hand, is generally so clear it's more like looking out a window than at a TV screen. Of course, it can depend on the quality of the source material as well, so not all 1080i content looks perfect. 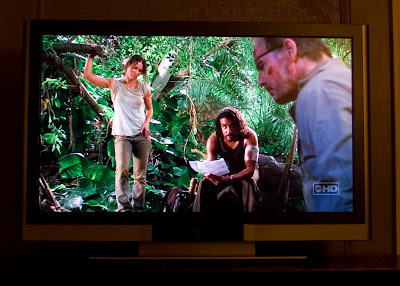 "LOST" in 720p. This was not a controlled environment, so don't take the two photos above necessarily as a comparison, especially considering the "Ghost Whisperer" image is half-res. (720p on pause is the full 1280x720, being progressive and all.) I really just wanted to show off some of what this set can do. So, how do I like my TV? While I admit to experiencing a bit of TV technology culture shock initially, I'm now in love with my Westinghouse. It does exhibit some very minor banding and its black level doesn't match my CRT, but its overall picture quality is almost unbelievable for the price. Once you go 1080p, you can never go back. I was also lucky enough to get a set with no dead or stuck pixels, which almost seems like a rarity if you read other reports from around the net about LCD TV's, regardless of brand or price. There are some new technologies on the horizon that will make for even greater improvements in picture quality in future sets. SED (Surface-conduction Electron-emitter Display) technology, for example, offers the best features of CRT, LCD and plasma with few of the drawbacks (though it is susceptible to burn-in). 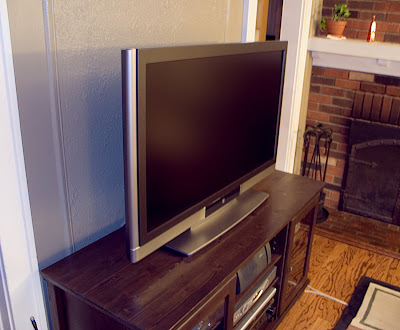 LCD televisions using LED backlighting with "local dimming" will bring traditional LCD sets up to par with CRT sets in contrast and black level by substituting LED's for traditional fluorescent bulbs and enabling the set to turn off the backlight completely in black areas of the picture. And some are still keeping the faith in OLED (Organic Light Emitting Diode) sets for the ultimate in contrast, though it's looking less likely that this technology will ever prove practical. Personally, I think LED backlighting with local dimming will prove all the industry needs to propel picture quality to new heights and accelerate HDTV adoption. These sets will be on the market within the next year, and as prices continue to fall, expect them to be affordable only a year or two after that. I obviously couldn't wait that long and I'm not sure it really makes sense to. 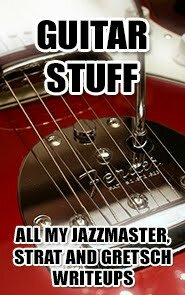 No doubt, though, that my next set will be even better than my Westinghouse. Until then, I'm more than happy with what I've got.